LiquidWeb Hosting Review | Customer Reviews | 2011| Who Is The Best? Liquidweb is a fairly large and established web host in the industry, and a widely respected one as well. They did not make our top 10 web hosting picks this year, but we will be keeping our eye on them because we are hearing a lot of positives about their company. Liquidweb has positioned itself as an expert web host, that’s how they market themselves in fact — as experts. They go after the higher end of the market, as their starter hosting packages indicates ($14.95 a month). They are not the cheapest web hosting company, by far. In fact that are quite a bit more expensive than many other hosts, but they do offer a good about of bandwidth and storage. Also, they do offer standard nightly backups, which most other big hosts do not offer, this ensure against us losing our updates, so it’s a nice safeguard. We know a lot of folks probably won’t mind paying for for this type of added security. They are also a company with a lot of experience, having been around since 1997. And that’s very important in this business, as we always say, because having experience means that they have systems in place to take care of trouble shooting. Trouble shooting is the name of the game in IT and in web hosting in particular. Web Hosting Masters loves hosts that have been around for a while and have gone the distance. Who is LiquidWeb’s Ideal Customer? Because Liquidweb is a more expensive service, it’s probably not best for newbies and for personal sites. For these purposes might we suggest a company like Hostmonster, or even our #1 2011 pick — Fatcow. These are fantastic companies with much cheaper shared hosting plans. A person who wants to go with a plan from LiquidWeb will probably be a person who’s looking to upgrade their hosting and transfer some sites from an under performing host. Another person would be a small business owner who is looking for a fully managed solution, as LiquidWeb pays close attention to it’s service — although we have heard reports that all is not perfect in Camelot. If you do buy a larger plan, you get a few freebies like some free domains, and perhaps a free SSL. An SSL would be important for a larger ecommerce site or even a small business site that gets a could bit of traffic, as it is critical for security and online purchases. There isn’t a whole lot of bad news to report about LiquidWeb and we could see them sneaking into our top 10 next year, unless they do something drastically wrong. We have heard a few complaints about service and charging for fixing certain scripts, as well as some database problems — but many times these are user generated problems. Before you buy any web hosting from Liquidweb, please do check our our web hosting comparisons and our top 10 web hosting picks for 2011, it will give you more information about who’s really best for you. I agree with those who say that LiquidWeb is for webmasters who are serious about their websites. LiquidWeb gives you the most advanced web hosting features you can find plus you get excellent stability and reliability. They say their technical support is heroic and I believe that this is a good way to describe their entire operation. Not once have they failed to deliver what they promised to me. Easy to scale up. Great choice of packages for every need. Those are the things that make LiquidWeb stand out from the rest. Liquidweb is the top choice for those serious about their web hosting. Their servers are fully reliable and available all the time. I’m currently hosting at a cloud web hosting solution with them. They’re not the cheapest web host by any definition but the price they charge is really worth the service you get from them. They also have their own dedicated data centers. This is contrary to many other web hosting providers who simply rent servers from a third party company. Beware if you’re dealing with cheap web hosts. Even if it looks like you’re dealing direclty with the host in this case you’re probably dealing with a reseller of a reseller of a reseller. Then it won’t be a surprise when something goes wrong or doesn’t work the way it was promised to you. Liquidweb is definitely not for newbies to hosting or people with no technical skills at all. But if you’re a serious webmaster and need the best web hosting solution for your websites, they’re the way to go. Yes, there are a few other hosting solutions that offer service that is just as good, Liquidweb is not unique in the world with their offerings. But know that they’re definitely better than the vast majority of webhosts you have listed on your site, that is 100% for sure .. I have one of their smart servers and am thrilled with the service provided here. 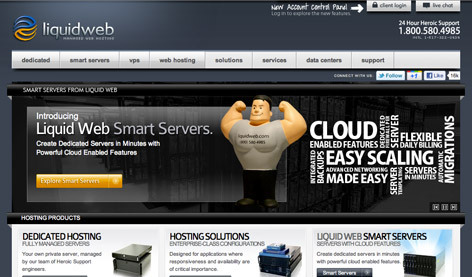 Liquid web is the best web host for dedicated server hosting. Good bandwidth and package options, good reliability and very fast support. LiquidWeb has everytihng you could need from a web host. LiquidWeb is the host that is used by my business for some accounts not really by choice but rather because we bought out a company that had a subscription with them and transfering things over to our own host would disrupt things too much for the moment. It’s a VPS hosting plan with 75 GB storage, 880 MB ram, 1 TB transfer and 1 CPU. The lowest one they offer at this point is probably what we have. Price is good but there are cheaper VPS web hosting providers.